Gaeng koa is one of the most ancient curries, developed after chiles were brought to Thailand in the 16th century by the Portuguese. The ingredients blend the tastes and flavors of opposite elements — earth and wind — to create a perfect balance, not only in taste, but also for health. Gaeng koa is a lighter curry using less coconut cream and more coconut cream and milk combined. The paste can also be used as seasoning for stir-fried dishes and savory custard. Pound the salt and garlic together in a mortar until they form a paste. 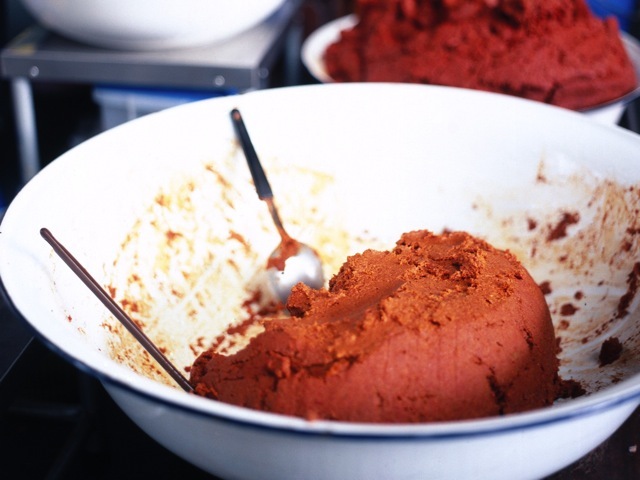 Add the remaining chile-paste ingredients one at a time, adding the next only after the previous one has been incorporated into the paste. The paste will keep in an airtight container, refrigerated, for up to a month. Add the main ingredients to the simmering broth. Once they are cooked, add the slivered lime leaves and stir until limp. Serve immediately. For a different twist, make this with 2 cups small shrimp and scallops, 1 pound large mussels or ½ pound smaller ones, and 1½ cups sliced tart fruit such as apricots, tart plums, or grapes.